Summer Camps & Lessons | Elite Sports Clubs: Where You Belong. We welcome kids as young as 3 years old to join us at the club this summer for three months of sports, games, fitness, and of course fun! 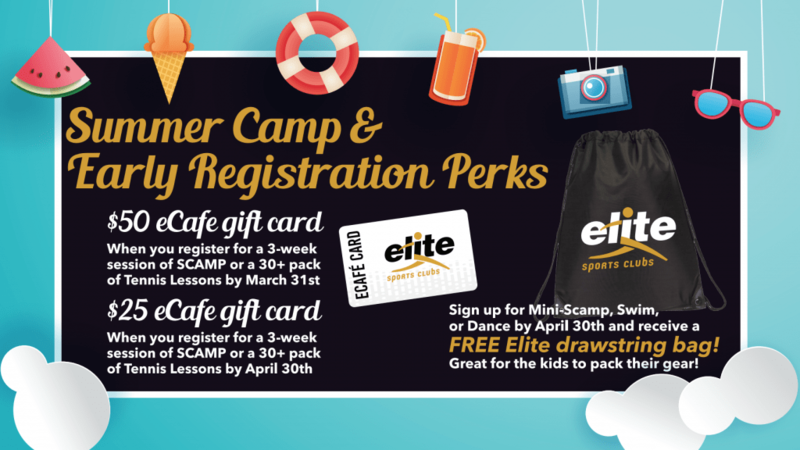 Elite Sports Clubs offers a variety of camps, including our summer day camp “SCAMP” which includes tennis and swim lessons, or “Mini SCAMP” one week half day camp for the younger kids. We also offer Lessons in Tennis, Swim, Dance, Music, and Martial Arts. Sessions and packages vary to fit your family’s busy schedule this summer. So, choose what works best for you! Fun and fitness for kids, and peace of mind for busy parents. Every summer since 1987, parents have trusted Scamp to provide an exciting program of fun, friends, and fitness for boys and girls, ages 4+. Our day camp offers an incredible variety of supervised, age-appropriate indoor and outdoor activities in a completely safe, secure environment. Open to members and non-members. Return registration & health forms to the Front Desk or email to Camp Director. Children who have completed full day (5K) kindergarten may register for full day SCAMP. Please bring cold lunch, swimsuit, and towel. No lunch provided. Please bring swimsuit and towel. Add on any or all Fridays to your SCAMP week. No Pre or Post week sessions. These are 3-week sessions, Monday-Thursday. Friday add-on also available for an additional fee. No camp Tuesday, July 4 and session will include Friday that week. These are 1-week mini sessions, Monday-Thursday. Friday add-on available for pre-scamp only for an additional fee. No Friday option for post-scamp. Before & After Care: $4/half-hour, children picked up after 6:00pm are charged $10 late fee. Registration after May 31st includes a $50 fee. No credit or prorating will be given for days missed. There is a $50 late cancellation fee if notification isn’t given 7 days prior. Enrollment/Health Forms MUST BE returned with registration. Mini Scamp is designed so your child can enjoy indoor and outdoor Elite activities in a cooperative and social environment. Mini Scamp makes for an active, productive, but most of all FUN summer! Includes indoor & outdoor play, pool time, organized games and sports, arts and crafts, and weekly themes. Open to members and non-members. Return registration form to the Front Desk or email to Camp Director. Please bring a swimsuit and towel every day. Program information & health forms will be sent via e-mail upon completion of registration. We will charge the session amount at the time of registration. No credit or prorating will be given for days missed. There is a $50 late cancellation fee if notification is not given 7 days prior to start date. Children enrolled in summer tennis lessons can attend any class at any Elite Sports Clubs. Pick a package that best suits your summer schedule. Open to members and non-members. Return registration form to the Front Desk or email to Summer Tennis Director. Your child’s first tennis experience establishes a foundation for hand-eye coordination, basic movement, listening skills, team cooperation and comfort on a tennis court. It’s a fun-filled introduction to the great lifetime sport of tennis. This class is taught on a 36′ Red Court. Ages 5-8: A focus on introductory rallying skills and beginning stages of cooperative tennis. Students will learn how to initiate a rally, how to move and judge a ball, and racquet control. As they advance, students learn basic tennis tactics and athletic skills, while developing social skills and group attitudes. They will be playing by the end of the session, guaranteed! Classes are taught on either a 36′ Red Court, 42′ Red Court or 60′ Orange Court depending on age and ability. Ages 9-10: This program is for players who may have taken several sessions of tennis and can rally the ball. Kids will gain better technical and tactical skills, which will help them to achieve early success for a greater lifelong enjoyment of the game. Classes are taught on a 60′ Green Dot Court over a standard tennis net. The Future Stars program is designed to introduce the basics and fundamentals of tennis. Players will learn the correct mechanics of each stroke, proper court positioning, and movement, as well as sound strategies for future growth and development. All basic techniques will be reinforced constantly through coordination exercises, competitive fun games, and singles and doubles play. The Excellence class is a player development program that improves the more advanced player’s technical skills, as well as mental toughness. High-intensity drills that develop speed, coordination, and overall athletic ability will be a part of this program. Strengths, weaknesses, and current stroke arsenal will be analyzed. Singles and doubles point play will be interspersed with individual attention to ensure that the player’s highest potential is reached. Invitational classes are by the level of the player and not by the age of the player. The High-Performance Tennis Program is taught by Elite’s Top Tennis Pros. By combining structured match play with lessons, players receive close to 100 opportunities of tennis during the summer. Prices are the same for members and nonmembers. The 90-minute unlimited package can also attend 60-minute lessons. Refunds will not be issued for unused lessons. Our swim program offers parent-child classes as well as group levels 1-4 where beginners start by learning breath control, safety skills, and the crawl; to our more advanced classes where they practice lap swimming with flip turns and refine all the strokes. All lessons are 30 minutes long and meet 2 times a week for 3 weeks with certified instructors. Swim lesson levels follow Red Cross standards. Open to members only. A parent-child water class for children 6 months to 3 years. We will work on water adjustment, parent holds, getting in and out of the water, submersion, assisted floats, basic arm and leg motions, games, songs, and having fun in the water. A class for 3-year-olds and up. Students will be in the water without their parents. We will work on water entry and exit, submerging and holding breath underwater, opening eyes underwater and retrieving objects, floating on front and back, gliding on front and back, rolling over, treading water arm and hand actions and assisted swimming on the front and back. Students must be able to float on front and back for 5 seconds, glide 2 body lengths on front and able to submerge for 3 seconds. We will work on bobbing, retrieving submerged objects with eyes open, rotary breathing, all of the front floats, gliding on front and back, rolling over, treading water, changing direction while swimming on front and back, finning and independent swimming on the front and back. Students must be able to push off the bottom and move into a treading or floating position for at least 15 seconds then swim 5 body lengths, swim independently using combined arm and leg actions for 5 body lengths. We will work on breathing to the side on front crawl, treading water for a minute, survival float, streamlined push-offs, increased distances for front and back crawl, elementary backstroke. Introduce breaststroke kick, scissors kick, dolphin kick, and basic survival and rescue skills. Students must be able to swim the front crawl, back crawl, elementary backstroke for 25 yards each and tread water for 1 minute. We will work on survival swimming, open turns, increased distances for front crawl, back crawl, breaststroke, butterfly, sidestroke and elementary backstroke. Swim Club is for junior swimmers who can swim 50 yards (1 full lap) independently, and would like to improve stroke production in a fun, social environment. Swim club gives participants a taste of what being on a competitive team is like, and focus will be on competitive swimming skills and endurance. View our Swim Lesson Level Parent Guide. Participants may attend any class at any club the entire summer! Kennedy Dance Company, LLC is passionately committed to providing each dancer with the opportunities and preparation to learn the art of dance with positive, structured and inspiring teaching methods. Open to members and non-members. Program Fee: All students enrolling in lessons must also pay a costume and recital fee per session in the amount of $25 per dancer. For summer programming, this covers recital costs, t-shirt, and swag bag. The Elite Dojo has been providing martial arts training to children, teenagers, and adults for over four decades. We are committed to creating a community of students and professionals working together to build the strength of body and character. We offer a flexible schedule with classes running five days a week so you can attend any class each week according to your needs. We’re especially proud of our team of instructors who guide students in their development of a high degree of physical skill in the martial arts but also to inspire self-confidence, integrity, and ethical decision-making. Summer is an excellent time to try out music lessons with Mozart’s Gym at Elite! For the young and the young at heart, we’ve got you covered with excellent instruction in piano, guitar, clarinet, flute, saxophone, violin, theory & composition (options vary by location). Traveling a bit this summer? No worries! We accommodate you with a flex week built in to the schedule and one additional reschedule permitted. And with our fantastic SUMMERJAM outdoor student concert, there’s music in the air…join us! We look forward to seeing you! Private lesson students first enrolling for the 2019 Summer Session (who did not pay the Annual Program Fee) must pay a $25 Program Fee in addition to the Tuition Cost. This fee is used to offset the cost of student music books and materials provided by Mozart’s Gym.